My only complaint--it is a pain to prepare the mud and put it on your face. I have been using Dr. Hauschka products for ten years. When you purchase you get free samples and that was how I met Clarifying Clay Mask. Masks typically wreak havoc on my sensitive skin. When I used the sampler (enough for one indulgence) I noticed immediate pore shrinkage, so I ordered. I use three different Dr. Hauschka masks, but my favorite is Hydrating. These two products together are the perfect duo for sensitive skin living in super dry/cool climates. I love the natural elements and organic smell of Dr. Hauschka products. It's difficult to be disappointed with products that are so close to 100% perfection. Thank you for keeping our skin happy and healthy! I haven't used the Clarifying Clay Mask for too long, but I do believe I am noticing refinement of pores. It is easy to apply. I have been looking for a cleaning mask for a very long time. This mask is very unique and easy to use. Before I purchased it I read the reviews. Some people thought the mask becomes pasty after mixing with water. It does not. Simply mix and put on face. It dries and stays on the face after a minute of two. Very easy to use and does the job. I tried a sample of this mask. I added water as described but it came out thinner than expected and since I was ysing the sample I had no more powder to thicken it. For one use the results were nice I had a little bit of inflammation on my chin and redness was significantly suppressed. I gave it 4 stars bcz it’s messy but beauty needs a sacrifice :) so if you don’t mind that than it’s pretty good. I began using Dr H products when I was 34, and even though my skin is much older - I'm 71 - I still use this clay mask once monthly for a really deep cleansing. This mask makes my face feel so detoxified. I use it once a week to clean out my large pores. The instruction for this clay mask is very confusing. I mixed it with 1/2 teaspoon and it was still too watery add more powder still watery. However, it dries really quick makes my face tight, and I love the feeling of it after I removed it with warm water. I just wished and hoped it was already made clay not one I had to make myself. Gentle to the skins and great overall Clarifying Clay Mask. ....but more drying than I thought it would be. I do have oily skin so it helps with that T-zone mess...but after use I feel rather dry and a little itchy. Maybe I need to think it out some? This is one of my favorite products! I love to use this mask about once a week, followed by the Revitalizing Mask for really smooth even skin. I have super sensitive skin and this mask combination always soothe and calms my skin. This mask works to tighten and cleanse the pores before applying another mask, i.e. hydrating mask. This mask makes my skin feel so soft. I know I'm not supposed to but I can't stop touching my skin! It has a light earthy scent. Application is smooth and easy, not messy. Simply apply and sit back and relax- a home spa experience! This will definitely be a part of my weekly skincare ritual forever. Sublime and excellent quality. I LOVE this mask. Whenever my skin is breaking out, I use this and it definitely helps by the next morning without overly drying my skin. I also use this in conjunction with the Steam Bath and Revitalizing Mask for a full facial experience. Awesome product for oily and combination skin. Clears the pores and tighten the skin. Also love the small packets for single use. I absolutely love this clay mask. It feels amazing on my skin and doesn't dry it out too much. My skin feels so soft and clean afterwards. I do wish it was already mixed for convenience, but the results are great. I just started using this mask a couple months ago. I have been using it once a week and my skin definitely feels more refined and smoother to the touch. This is a great new addition to my skin care regimen! I'm obsessed with this mask. It comes as a powder, which I wasn't expecting and was unaccustomed to. I like that I can mix it when I would like to use it, and adjust the thickness. Effective, and doesn't bother my ultra sensitive skin. I use this with the steam bath and feel like I walked out of a $300 facial at a spa! It's amazing the benefits to the skin speak for themselves! It seems that this mask really goes deep into pores to extract impurities. Other clay masks I've used are great, but don't seem to go as deep. Be prepare to bring impurities from deep down up to the surface. This is a different kind of mask than I am used to but it worked. It didn't exfoliate much but it did draw out. Skin feels so moist and clean! i have a great experience with almost all Hauschka products including this one. It does not dry out the skin and I did see an improvement. The price is a bit high for my budget but it lasted forever! I really like this clay mask - it works really well, and my skin benefits from when I use it. The drawback for me is that it isn't ready to go... you have to mix it with water (and/or a bit of cleansing milk), which while that gives you the opportunity to get it to a consistency you like, I always seem to fumble with it. So I wish it was a product as good as it is, but it came straight out of the tube or bottle ready to be applied. The ratio of liquid to clay never seems right to me - so I am not sure why I don't get a consistent consistency, and have to add more powder (even if I start with not too much liquid). That being said, it is a really good mask otherwise! I love Dr. Hauschka products but this is the only one that the price tag cannot be justified! The ingredients and the price, together, do not make a lick of sense! I'll stick with my $7.00 1lb tub of bentonite clay from the pharmacy. This clay mask is pretty good, even for sensitive skin, but then you should apply a thinner layer. Was using this mask once a week for a few months and didn't notice any difference in the way my skin look. Didn't help with acnes either. Cheap clay from the pharmacy (under 1 dollar) produced better results. I use this mask about once a week, and I really love how it makes my skin feel. I have really sensitive combination skin, so it's hard for me to find a mask that doesn't make me break out. This one does the trick. My only complaint is that it's a little messy, and leaves a brown gunk in my sink that I have to wash out every time. Oh well, it's worth it! Ive only used it twice but seems to help with pimples. Keeps skin less red and helps get rid of pimples. I love this product and have been using it for 3 years. It helps my sensitive combination skin "shed" dead cells and dry patches on my face. It makes my skin glow and, most importantly, absorb the nutrition from the crèmes much better. Both my daughter and I love the clay mask! She has oily skin, I have sensitive, dry skin and we both use it regularly (I, not as often as she!). We have tried other brands and even clay from the herb store, but not with as lovely results. Once in awhile my skin acts up with clogged pores and blemishes (stress-related). I purchased a few samples of Dr. Hauschka masks (revitalizing is wonderful too!) to try. This is a wonder for rebellious skin. I use it all over or as a spot treatment. It is not too drying like many clay, problem skin masks. 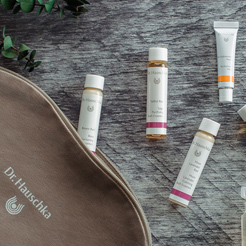 Like most of the Dr. Hauschka range is is kind to sensitive skins. don't wait to try this! Held off for 3 years after starting this line to try the mask b/c didn't want to fiddle with mixing it myself but it's a great mask to clear pores and not drying. I have been using this product for over a month, I can just keep loving it more and more each day. I am so amazed by its effectiveness! This is the best cleansing mask in the cosmetic market,I guarantee!!! I was searching any organic and natural products because I am reaching to my 30s. The products I used before like Dior Snow, Chanel Skincare, Clarins, Estee Lauder, Lancome, Kiehl's, Glycel, Olay, Simple Skincare, Lancaster Skincare, Nivea, Neutrogena and more. Those products only got my skin conditions worsened. I ended up changing different brands to see if there is a better solution. Until I found this product. It eliminated my skin problems including big pores, dryness, peeling, redness, inflammation, acne, pimples, black and white heads, yellowish color, darkness, tiredness on the "First Time Application"! Its clay-like powder makes it easier and unique to be mixed with pure water. Depending upon the skin texture and facial contour, I can make it flexible and applicable with a mid-size cosmetic brush. After applying the wet clay onto my faces, I simply can do anything until the 10-15 minutes elapse. I can see a drastic change right in front of the mirror of my skin. At least 90% brighter, 98% softer and smoother, 85% pores are tightened and disappeared, 95% redness has been removed, 95% of my skin tone is being evened out, 98% of my yellowish and dark skin color have been improved, 95% of my skin color is whitened. 90% of pimples, acne are removed or improved, 85% of black and white heads are softened and removed, 98% of dryness and peeling is improved, 98% of my skin has been moisturized and revitalized, rejuvenated . Overall, this is the best product for flawed skin conditions which I have ever found and used. I highly recommend this product to my family members like my sisters and mother. My mother is 60s now, after she used this product. She looked 90% younger and her skin problems were 90% removed and improved for the first time experience. You are going to love it! Hi Myra. Thank you so much for the thoughtful, detailed review! We truly appreciate that you would take the time. And a second thank you for being a Dr. Hauschka customer. Have a great day! Amazing and works also for sensitive skin! 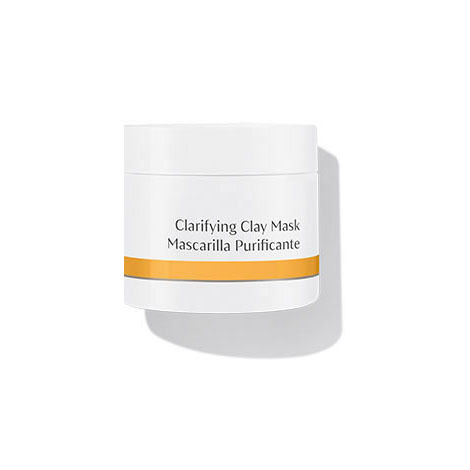 The clay mask does exactly what it says in its description - clarifies the skin, leaving it smooth and clean. For me the bonus is that it works well also with my sensitive skin, that tends to become reddish around the chin. Used this mask for 2 years now and I love it! My favorite by far. The feel of my skin after the mask is so soft and clear and it's very easy to wash the mask off, which is not the case with many other companies products. Perfect blend of soothing and cleansing. Having sensitive, yet oily and congested skin, I've tried a lot of masks. They've all been too drying or aggressive leaving me red, irritated, and more broken out than before. This mask does not dry me out at all, and leaves my skin glowing and my pores clearer and smaller. Everyone in my family now uses this mask after seeing my results. I recommend this product to anyone who wants to purge their skin of any impurities. Really liked this product. Masks are always a fun indulgence, his one was quick and had a visible toning and brightening effect. My skin tone appeared very even and clear afterwards. Tried this once so far since getting it. I like that you mix your own paste. Worked great! I like the clay mask. You can mix it with the silk powder and lavender water. Or I find I like to make my own concoction. I think it helps but you must be consistent at least once a week. One of the best products I have ever tried for my skin type. I would recommend this product to anyone with problem skin. I breakout from time to time and all I do is cleanse my face with my cream cleanser and apply this mask to my problem areas. I wake up the next morning and my skin is extremely soft and my breakouts are less noticeable! I swear by it! Prepare your skin for deep cleansing with Cleansing Cream and Clarifying Steam Bath. Learn about our Signature Treatments.